A filter is a necessity for ponds and water gardens, but owners face a dilemma: they aren’t supposed to clean them, and yet they are susceptible to becoming plugged. How can a plugged pond filter be prevented? The filter contains a large amount of bacteria which is beneficial and dissolves the toxins which are present in the water. It also houses debris and slime which over time will clog the filtration unit. While you definitely want to remove the slime, the beneficial bacteria are important and should be preserved. Here are some ways to preserve them while unplugging the filter. Many pond owners are excessive when it comes to using layers, but this isn’t necessary. In fact, if you have three filter mat layers or more there is a good chance you’re reducing the flow and creating space where debris can get stuck. Two layers are all that is necessary. Monitor the skimmer filter regularly and clean it out when needed. This filter component is not designed to eliminate miniscule particulates which means you can use filter media which is low density so that excessive debris is kept away from the pump. When the media is too dense plugging will occur which will restrict the flow. The densities of the filter media should be altered and stacked so the water will flow from low to high densities. When they are mixed you will have sufficient surface area for bacteria to grow with stronger water flow and less plugging. You should know the plant to fish ratio of the pond. A larger quantity of fish means greater waste and an increased chance of the filter becoming clogged. More plants means greater filtration for the water. You don’t want to overwork the filter by keeping a pond that is imbalanced; so be sure to let the plants do what nature designed them to and keep your fish at reasonable quantities. 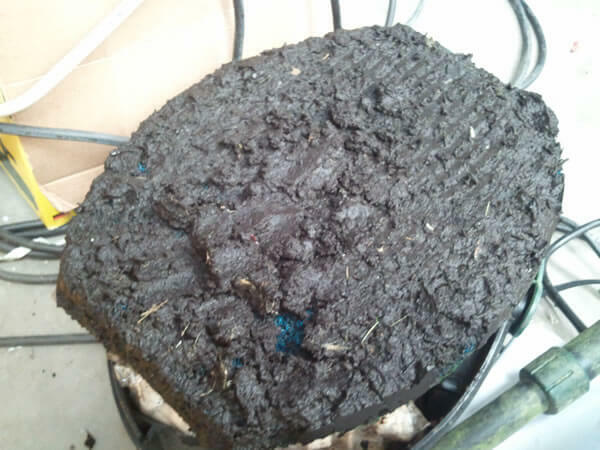 When the debris baskets of your skimmer filter become full of leaves and other things, you will need to remove them. Once they become full, the water will be forced to flow around them which will result in larger objects being carried along that could lead to filtration plugging. Sludge is not your friend and the last thing you want is it building up in the pond. A pond vacuum is a great tool for sucking up debris and it can then be broken down and removed which will improve the quality of the water while reducing the filter’s workload. After the media pads of the filter have been hosed down, you can help the beneficial bacteria increase their population by seeding the pads with additional bacteria. They will reproduce rapidly and will assist in the decomposition of debris. By using these techniques you can prevent the filter from becoming plugged without having to clean it.